This semester, Sylvie Douglis has traveled throughout Maine to interview village mayors, amateur drone photographers, controversial artists and members of a Byzantine micronation. 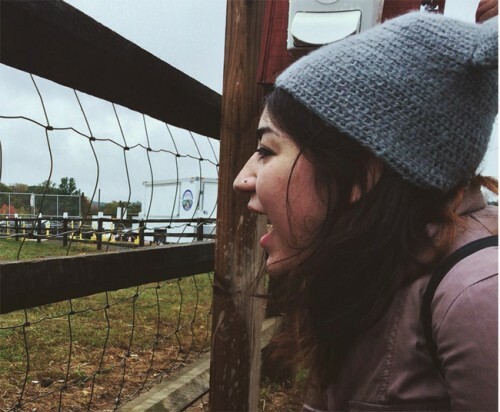 The experience is all part of the Eugene Lang College student’s work at The Salt Institute for Documentary Studies, a prestigious program in Portland, Maine that focuses on radio documentary and new media journalism. “It’s a lot of work but incredibly fun,” Sylvie says. The Lang junior has a passion for storytelling. Last year, Douglis was awarded a fellowship to assist in a Civic Arts and Humanities course taught by Assistant Professor of Digital Humanities Julie Napolin, in which students produced their own radio documentaries (she worked as a volunteer tape editor for five months). Once the course ended, Michael Garofalo, StoryCorps’s executive producer and a visiting professor, brought Douglis on board to edit tape at the Brooklyn-based oral history organization. Her interest in documentary led her to apply to the program at Salt, where she’s been working ever since.